Even if you don’t have much intellectual understanding of Dharma, even if the only thing you know is OM MANI PADME HUM, still the happiest life is one lived with an attitude free of the eight worldly concerns. If you live your life with the pure attitude free of attachment clinging to this life and simply spend your life chanting OM MANI PADME HUM—this six-syllable mantra that is the essence of all Dharma—that’s the purest Dharma. It looks very simple, very easy to recite. But if you think of the benefits, it’s not at all simple. Here, I’d to mention just the essence of its infinite benefits. When such a person walks down a road and the wind touches his or her body and then goes on to touch insects, their negative karma gets purified and causes them to have a good rebirth. Similarly, when such a person does massage or otherwise touches others’ bodies, those people’s negative karma also gets purified. Such a person becomes meaningful to behold; being seen and touched becomes a means of liberating other sentient beings. This means that even the person’s breath touching the bodies of other sentient beings purifies their negative karma. Anybody who drinks the water in which such a person has swum gets purified. Because we have met the Buddhadharma, and especially this method—the practice of Compassion Buddha and recitation of his mantra—it is easy to purify negative karma and collect extensive merit and thus to achieve enlightenment. We are unbelievably fortunate. In places such as Tibet, Nepal, India and Ladakh, there’s a well-established tradition of doing the Compassion Buddha retreat and reciting 100 million OM MANI PADME HUM mantras. The one held at Chenrezig Institute was the first such retreat held in the West and the first in the FPMT organization. This is to happen there once each year—only once each year! If you’re feeling guilt in your life, you can overcome this through the purification of attending this retreat. Whoever attends a mani retreat is unbelievably fortunate. Even if you can’t attend the whole retreat, you can participate for two months, one month or at least a few weeks. You can do even just one week. I especially hope this retreat will also be established in Mongolia, since their main food is meat and so many animals are killed there every day. This practice helps purify that. After our temple in Mongolia has been built, I hope that thousands of people will attend mani retreats there. Gradually too, I would like this retreat to be established in other parts of the West. Even if you know the teachings on how to meditate on bodhichitta, you still need to receive the special blessings of the deity, Compassion Buddha. You receive these by doing the meditation and recitation we practice in the mani retreat. 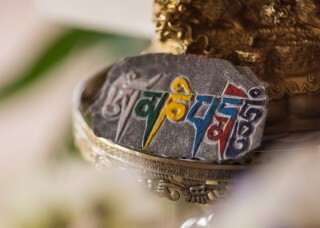 Therefore, recitation of OM MANI PADME HUM is one way to actualize bodhichitta–to transform your mind into bodhichitta and make your meditation on bodhichitta effective. Generally, according to my experience, in my home of Solu Khumbu in the Himalayas of Nepal, there are people who live their lives chanting OM MANI PADME HUM but have no idea of the three principal aspects of the path–renunciation, bodhichitta and the right view of emptiness–not even the words. Even though they can’t read and don’t even know the alphabet, they have great devotion to compassion and bodhichitta and live their lives reciting OM MANI PADME HUM. Such people are warm-hearted, very kind, very compassionate. This is proof from my experience that it has the effect of transforming the mind into a good heart and compassion. Without bodhichitta, you cannot cause all the happiness for all sentient beings. You cannot do perfect work for all sentient beings, and you cannot achieve the complete qualities of the realizations and cessation, even for yourself. One of Lama Zopa Rinpoche’s Vast Visions is for the FPMT organization to establish 100,000 100 million OM MANI PADME HUM retreats. Excerpted from Lama Zopa Rinpoche’s invitation to join the Chenrezig Institute mani retreat, composed by Rinpoche during a stay at Deer Park Buddhist Center in Madison, Wisconsin, USA in July 2000, scribed and edited by Ven. Lhundup Damchö; excerpt edited by Dr. Nick Ribush. The Lama Yeshe Wisdom Archive has made available Rinpoche’s entire teachings at the retreat, which have been edited by Ven. Ailsa Cameron. 1. These are karmas so heavy that they ripen immediately as a rebirth in the hell realm upon the exhaustion of the karma of this life. The five are: killing one’s mother, killing one’s father, drawing the blood of a Buddha, killing an arhat and causing disunity among the Sangha.